Children have a right to safe, healthy, and happy upbringings. As parents, caretakers, and responsible citizens, it is our responsibility to work towards providing this for all our nation’s children. Unfortunately, it is all too easy for a defenseless child to fall victim to the negligence, recklessness, or malice of others. When preventable injuries befall our precious children, it is only right that we demand and fight for justice. 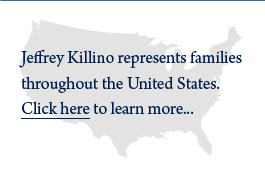 Nationally-recognized child injury attorney Jeffrey Killino works hard to protect the rights of hurt or neglected children. Our experienced attorneys, paralegals, and investigators share the goal of helping injured families win the compensation they need and the justice they deserve. If your child has been hurt in a preventable accident caused by negligence or a defective toy or other product, call us today at 1-877-875-2927. There is simply no excuse for negligent or abusive actions that cause injury to innocent children. Whether your child has suffered because of a car, playground, or bicycle accident, a toxic toy, medical malpractice, or negligent childcare, you have a right to hold the responsible party accountable in a court of law. Contact us today to learn how we can help you obtain the compensation you and your child deserve. If your child takes the school bus, this is a must read for parents on safety information you need to know, Click here to learn more. Children are, by nature, less fearful than adults and less inclined to appreciate the risks associated with play or other activities. As a consequence, they are susceptible to accidents throughout any given day. While many accidents are caused by nothing more than children’s own exuberance, others may be due to someone’s negligence or a defective product. Our child-accident attorneys have the experience and expertise to identify all the causes of your child’s accident injury or death and to hold each and every responsible party accountable through legal action. Child injuries and deaths may be caused by accidents that could have been prevented were it not for someone’s negligence or the child’s exposure to or use of a defective toy or other product. A child’s injury or death may also be caused by pediatric or other medical malpractice. Birth injuries, for example, may be caused by the malpractice of obstetricians and others who take part in the care and treatment of a pregnant woman and her fetus during the woman’s pregnancy or the delivery of her child. The negligence of pediatricians, such as the misdiagnosis or delayed diagnosis of a serious condition or illness, may also result in severe injury or death to a child. No matter what the cause of your child’s preventable injury or death, our dedicated team of child injury lawyers is here to provide you with exceptional representation and the aggressive pursuit of justice from all those who have caused your child’s injury or death. Amusement park injuries may cause severe injuries or death to a child who had anticipated nothing more than a day of fun. In addition to defects in amusement park rides, the negligence of ride operators or park maintenance employees may cause children’s injuries or deaths. Our amusement park injury attorneys have experience with all types of amusement park injuries and are ready to fight for the compensation you deserve for your child’s injury or death. Children’s bicycle accident injuries can be caused by defects in bicycles or bicycle helmets, the negligence of other bicyclists or drivers of motor vehicles, or the negligent maintenance of bicycle paths. Our bicycle accident attorneys have extensive experience with bicycle accident cases and will work to achieve justice for your injured child. Children’s birth injuries are often caused by medical malpractice during a mother’s pregnancy or the delivery of her child. Asphyxia birth injuries, which are caused by a deprivation of oxygen to a fetus or newborn, are the most common type of birth injury and include cerebral palsy and HIE (hypoxic ischemic encephalopathy), both of which can result in lifelong damages. If your child has sustained any type of birth injury as a result of medical malpractice, our highly experienced and nationally recognized team of birth injury lawyers can help you obtain financial damages from the medical professionals responsible for your child’s birth injury. Children are often severely burned as a result of someone’s negligence or a defective product. While contact burns sustained from touching a stove or hot-water heater can occur when a child is not properly supervised, tap-water burns are the most common of children’s burn injuries and can result in a child’s serious injury or death. Our child burn-injury attorneys have experience with a wide variety of burn-injury cases involving burns caused by the negligence of child caregivers or defective products to which a child has been exposed. We will thoroughly investigate the causes of your child’s burn injury as well as the identity of all those who may be held responsible. Car seats save the lives of a great many children every year. When a child’s car seat is defective or improperly installed, however, the child may sustain serious injury or death as a result. Our car seat injury attorneys have handled a wide variety of traffic accident cases, including those arising out of injuries and deaths caused by defective car seats, and will put that experience to work for you. A child’s brain injury may be caused by an obstetrician’s negligence during the mother’s pregnancy or the child’s delivery, pediatric malpractice, the ingestion of toxic substances, non-fatal drowning, and a great variety of additional accidents. Our child brain injury lawyers will apply their widely recognized expertise with these complex cases to do what it takes to achieve justice for you and your brain-injured child. Any dog can bite a child and cause the child serious injury or even death. Dog owners may be held liable for such injuries if the owner’s negligence is a cause of the injury. In some states, owners may be responsible for dog bite injuries even in the absence of the owner’s negligence. Our dog bite injury attorneys will use their thorough knowledge of dog-bite injury law to provide you with competent and aggressive representation for your child’s dog-bite injury case. Children’s swallowing reflexes and throat size are unequal to those of adults. Children also have a propensity for placing objects in their mouths. This combination of factors makes children particularly vulnerable to serious choking injuries or death. From toys with small, removable or easily breakable parts to adult products with small parts that are accessed by children, products that pose choking hazards to children abound in the average household. Whether your child’s choking injury was caused by someone’s negligence or a defective product, our team of choking-injury attorneys can help you hold all the parties responsible for your child’s choking injury or death liable through legal action. Parents rightly expect their children to be safe while they are in their cribs, yet, defective cribs and products intended for crib use often cause injuries and death to small children. Cribs with slats that are too far apart and allow a child to be caught and strangled, crib bumpers or pads with strings that can strangle a child, and crib mobiles with small parts that can cause a choking injury or death are only a few of many examples. The manufacturers of these defective children’s products may be held legally responsible for injuries or deaths proven to have been caused by the product’s defect. Our crib injury attorneys have fought for the rights of many children who have been injured by defective cribs and will fight just as diligently for your crib-injured child. Daycare injuries and even deaths are far more common than most parents realize. When these injuries are caused by the negligence of a daycare center and/or its employees, the center and employees may be held liable for a child’s resulting damages. Our daycare injury attorneys have handled a great variety of daycare-injury cases and are dedicated to achieving justice for every daycare-injured child. Products intended for a child’s use may cause a child’s serious injury or death as a result of a product defect. Educational products with button batteries or magnetic pieces that easily fall out and can be ingested by a child, for example, are perilous to a child’s health. Children’s lamps with cords that can be pulled down by a child and wrapped around the child’s neck pose serious strangulation hazards to small children. Children’s clothing with drawstrings creates similar dangers for young children. Our team of defective children’s product attorneys has extensive experience with all types of defective children’s product cases and can provide you with the expertise you need to hold the parties responsible for your child’s defective-product injury accountable. Though most people think of drowning as a fatal accident, drowning (which may be defined as any accident that involves the deprivation of oxygen through the breathing in of water) can also result in non-fatal injuries, such as brain damage. Land or property owners on which pools or other bodies of water are located may be held legally responsible for the fatal or non-fatal drowning accidents of children who are given or gain access to such water. In many states, even the owners of land on which a child was trespassing when the drowning accident occurred may be held liable for the child’s injuries or death. Our drowning injury attorneys have handled drowning-injury cases in multiple states around the country and are thoroughly versed in the law and science required to successfully hold all those responsible for a child’s drowning injury liable for the damages suffered by the child and his or her family. Dangerous conditions on playgrounds or the negligence of playground supervisors may result in a child’s injury or death and the liability of private playground owners, maintenance companies, and/or playground employees. Our playground injury attorneys have extensive experience with playground injury cases, including those arising out of injuries caused by multiple defendants, and will work to obtain the compensation your child deserves from every party responsible for your child’s playground injury. School bus accidents very often result in serious injury or death to school children. These injuries may result from negligence of bus drivers who allow children to run around a bus, the negligence of private owners of buses who fail to maintain buses, or the negligence of other drivers involved in a multi-vehicle crash. In many cases, the owner of a bus as well as the maintenance company hired by the owner may be found liable for a child’s injuries. Negligent school bus drivers as well as their employers may also be found responsible for injuries caused by the driver’s negligence. Our school bus accident attorneys are dedicated to holding all those responsible for children’s school bus accident injuries accountable through legal action and to making school buses safer for children in the future. Jeffrey Killino filed a lawsuit to compel Mattel to pay for the testing of children across the country who might have been lead poisoned by 1.5 million toxic toys. Click here to learn more about the case. Toys are frequently defective, toxic, or otherwise unsafe for a child’s use. Some contain small parts that can easily come off and cause children’s choking injuries or deaths. Others are coated with lead-containing paint that can poison a child and cause brain damage, organ damage, or even death. Attorney Jeffrey Killino and his team of toy injury attorneys are known nationwide for their work in holding the manufacturers of dangerous toys responsible for children’s injuries and deaths caused by toy defects. In a case brought by our toy injury team against major toy manufacturer Mattel, Inc., for example, the company was ordered to provide free lead testing to children who may have been exposed to toys coated with or containing lead. If your child has been injured by a defective toy, we will work just as aggressively for you to achieve every bit of the compensation to which you are entitled for your child’s injury or death. For information regarding additional types of cases handled by our child- injury team, see Types of Child Injuries. 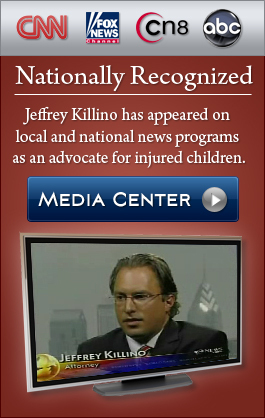 Child injury attorney Jeffrey Killino has dedicated his practice to representing injured children and their families. He has appeared on numerous major news channels, including CNN, Fox News, and ABC, in connection with his efforts to hold Mattel responsible for selling some 1.5 million lead-contaminated toys manufactured in China. If your child has been hurt by a defective product or someone’s negligence, contact child injury lawyer Jeffrey Killino at 877-875-2927 to learn more about your legal rights and options.